Love the idea of connecting major points with dedicated, protected lanes. Appreciate the current efforts of painted lanes but they just aren’t protective enough. It’d be great if the lanes were made in between parallel car spots and the sidewalk. That would make it feel much safer and bikers wouldn’t be in jeopardy when someone wanted to park. There are a lot of streets in and around downtown that could get that treatment. I’d love to see Blount St. reduced to a two lane and given a nice wide protected bike lane. It’s never busy enough to warrant three full lanes. I agree with the concept of delivering a few protected bike transit corridors as a priority. The opportunistic approach of adding on bike lanes and sharrows to funded construction projects is adding sections of streets which are “bike aware” but less than safe for real transit by bike. 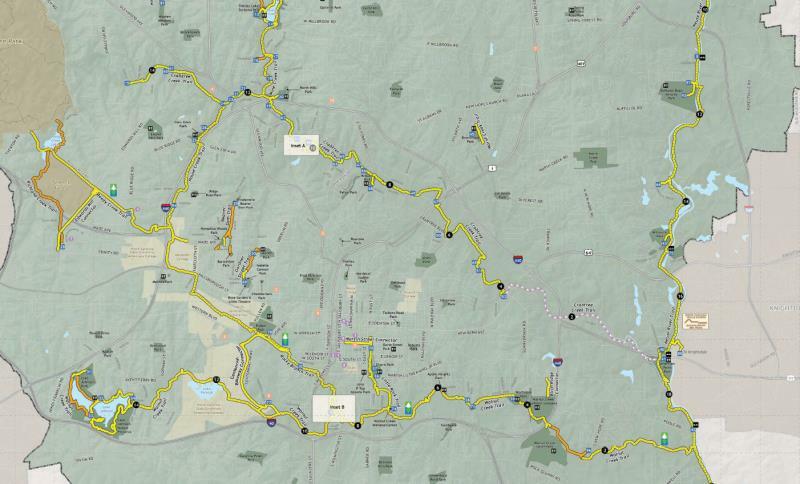 I have been experimenting riding a bike from North Raleigh to downtown via several routes with a combination of “bike friendly”, sharrows, bike lanes, greenways and city streets. It is difficult to put together a truly safe ride. Even new bike lanes are being painted between on street parking and automobile travel lanes. Driver side doors of parked cars will open into bike lanes. Raleigh could make huge gains toward making bicycle commuting and short trips (shopping and dining out) a reality by creating safe biking corridors from downtown out to the outer reaches of the county. Doing so would that make Raleigh more attractive to high tech and healthcare employers and the youthful employees they would need to attract. I think Raleigh has yet to embrace the idea that bike riding can be anything more than recreation. I ride my bike everyday. All over Raleigh, from N. Raleigh to downtown and all places in between. Only about 5% of residents in Raleigh walk anywhere. Having said that, I use the sidewalks when I ride. Why not? I get it the sidewalks were made for walkers …but nobody walks on them. As far as sharrows go, I love them and I feel perfectly safe riding on them. Raleigh is a very bike friendly community, it’s just a shame bikers don’t use common sense and use the sidewalks on busy rds. I’ve never understood why people think they have to ride their bikes on dangerous rds. When maybe 3-5x they may have to yield to someone on the walking on the sidewalk? It’s illegal to bike on sidewalks in many places. I don’t know about downtown Raleigh but it would be downright inconsiderate to bike on the sidewalks there. But you’re right that there are some roads where it’s really unsafe for bikers. Raleigh is decent for biking within the beltline. When I went to NCSU I biked everywhere. Hillsborough is vastly better for bikes now than it was back then (2005-2009 ish). At the time, you were definitely sharing a 5 lane road with cars going 45 if you were biking downtown. I ended up taking the sidewalk depending on the time of day, but the sidewalks had harsh curbcuts on one side of the street that you couldn’t bike over. I respect and admire those bikers who are willing to mix it up with cars on the roads, and who trust them to drive more carefully in the presence of marked bike lanes and sharrows. But personally, I would never seriously consider joining them. IMHO, bike lanes and sharrows are a waste of perfectly good paint, and a very temporary solution at best. They’re especially onerous because they give politicians an out – a way to feel progressive and bicycle-friendly without actually doing anything. Separate and dedicated bikeways are the only way to go, and would be well worth whatever it might cost to retrofit our transportation grid to include them. I would rate their importance to our city even higher than rail – which I consider a necessity. Protected lanes are great but we cannot have them wherever there are bikers. Making streets appropriately safe for bikers, pedestrians, and cars is much more important and is only accomplished by creating a culture of awareness for other modes. Sharrows and lanes accomplish this in part. That said, creating connected corridors will also be important. Once West Street is extended south under the tracks at Union Station and North to Wake Forest Rd – it should have a cycle track… which should then follow along Capital Blvd (separated) to meet the greenway just inside the beltline. 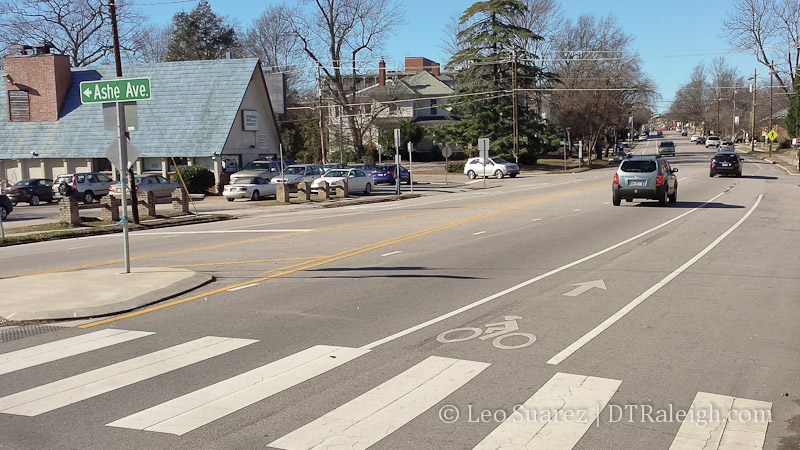 Person St/Wake Forest Rd could be a third corridor for a cycle track as well. Bike safety is in numbers and I think we should try to consolidate much of the bike traffic to main corridors and then rely on sharrows and lanes to finish the trips.